Security Scanner Monitoring and Recording… Made Easy! Remember the last time you were at the airport? The worst part is going through security and getting your carry-on baggage scanned, then re-scanned, and even possibly checked! This is because, many times, it’s hard for one person monitoring the baggage scanner to be sure that there is nothing suspicious with the luggage in question. Wouldn’t it be better, and safer, if everything was being double-checked by somebody out of sight? These scanner devices use X-Ray technology, similar to that used in medical applications, to “see through” your bag. The link between the actual security scanner and the monitor that is being used to display the images is, of course, a VGA or DVI signal. A simple analog video link between the baggage scanner and a monitor placed away from the scanner would not yield enough resolution or quality for proper analysis of the video. A high resolution solution must be implemented in order to transmit a diagnostic quality image, like the one originating from the VGA scanner, to a remote location like a control room. This is where frame grabbers become useful. Using a computer equipped with a frame grabber or a dedicated VGA recording/broadcasting device, the signal can be transmitted in real-time to a control room where someone would be able to review the baggage being scanned. 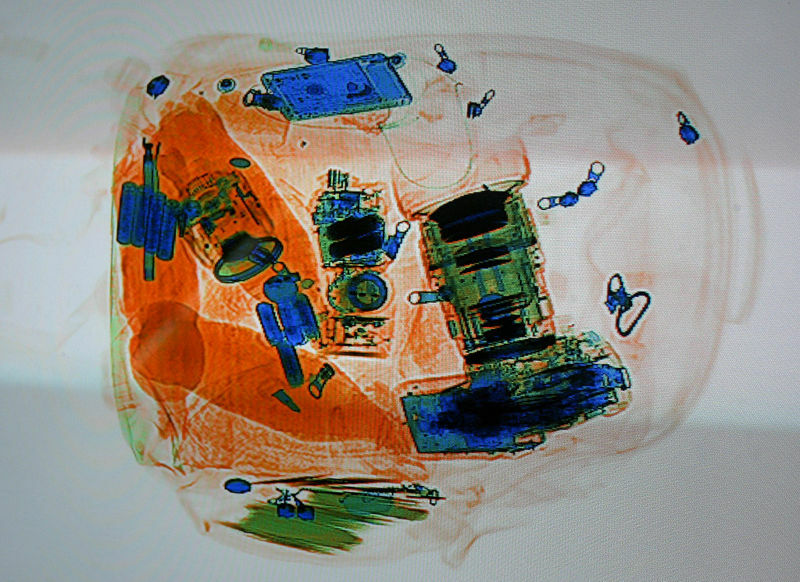 What’s more, if the VGA or DVI signal from the X-Ray Scanner is being recorded, the data can be saved and reviewed, meaning that suspicious luggage can still be checked before the passenger boards his or her flight. The diagram above shows how a frame grabber-equpped PC can be used to relay the images from the airport X-Ray baggage scanner to a separate monitor in a control room. While the signal between the frame grabber and baggage scanner is VGA or DVI, the link between the computer which is being used to grab the VGA signal and the computer used to output to the control room monitor can be an internet or local network (LAN) link. The computer equipped with the frame grabber can also be used to record and archive all data coming from the scanner. More common uses of frame grabbers, all of which can be used in this scenario, are described in our “Top 5 Uses for High Resolution Frame Grabbers” article.